On the return journey of my recent Finland trip I had to pay an excess baggage fee. I looooove Finnish design and so had treated myself to a Marimekko umbrella to brighten up grey mornings, a couple of Pentik wooden butter spreaders and a super sharp Fiskar cheese slicer. I also bought a limited edition Moomin mug to add to my collection. Yet all of these together weighed perhaps 2kg and, even though I had off loaded all the gifts of books and toys and food that I’d brought across with me, I was 4kg overweight on my way back. Dodgy scales? Nope. Rye bread. Ruisleipä, to be precise. I love the stuff so much I crammed as many bags of it as I could fit into my suitcase, hand luggage and coat pockets. And ended up paying an excess of £40. Totally worth it. But, as I eat a lot of rye bread when it’s available, I know it won’t look that way for long. So I’ve been trying my hardest to make my own ruisleipä these past few weeks and have failed, failed, failed. My own attempts (which I really should have taken a photo of) have been the wrong colour, the wrong taste and the wrong texture. I’ve tried the recipe from this website and from a Finnish cookbook. Neither worked. Even though I’ve lived in Finland for over 25 years I’ve never heard of anyone making their own rye bread. What about a forum for Finnish expats? It could be that the rye flour is different over there. Not that I know anything about making rye bread but I was surprised to see milk in the recipe you linked to. Did you use milk? I would have thought that it should have been made with water. I find a good way to search when you are looking for something from another country is to translate what you are looking for in google translate so you can search for it in the native language. Then choose images so you can see what looks like the thing you are wanting to make. Sorry, I wish I could be more helpful. The only think I can contribute, is with any sourdough waiiiiit … at least a week before using. Feed it every day and let it get SOUR. Also, this is a ‘wet’ dough due to the bubbles. They’re so even though.. hmm. I wish you much luck! Love your illustration at the top! 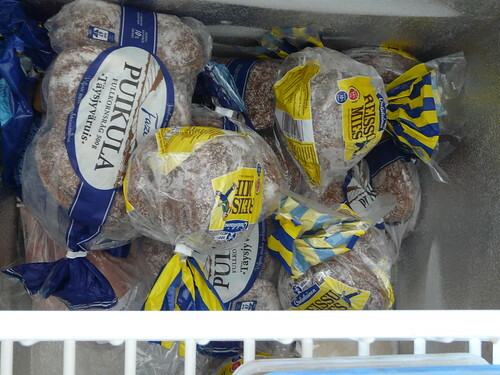 I just came back from Finland and I was so disappointed that my cousin did not have time to make bread for me. If you like I could ask her for her recipe. Your are right – there is something unique about the flavour. I’ve got a feeling you need the right kind of flour, real yeast – that stuff that has that heady aroma to it – my grandmother’s house in Koli, Finland used to smell like it, either Finnish or German sugar (for some reason they process their sugar differently and it does not have the same sweetness level – trying to find out more on that as it has piqued my curiousity). The first time I’d been to Finland I came home with the plan to make my own ruisleipä. When I asked on a cooking forum for a recipe I was told that hardly anybody makes their own, so I gave up pretty quickly and instead waited until returning to Finland to have some again. Sorry, this is not very helpfull, but I’ll be crossing my fingers that you’ll perseverance will bear fruit! Lots of people make their own,(if you live in UK) here how you can start it easily; a piece of dry ryebread from finland, soak in gold water until soft, just break it to small pieces , add rye flower and warm water(1/2 liter) +salt ,add flour to consistency of thick porridge, leave under plastic bag to next day, add moore flour and after several hours just spoon bread size blobs to buttered baking tray, bake them after few hours rising,see that they are risen, fork them first.Bake 200 degrees 40- 50 minutues. Keep room warm when rising, do not worry too much of times, longer the better, extra day adding flour and some water for very sour bread. Dry dou in edge of bowl for next bread or freeze a bitor strart from old rye piece again. this is nearest I have managed to make jalkiuuni leipaa…loose dou is the secret. So many great Finnish finds! I’m sure the extra weight fee was completely worth it- the Finns make the best rye bread in the world! I love the motif on your Moomin mug- my baby’s wearing a Moomin body right this very moment! Hi, I have no idea how you would make this however there is a company called A-bun-dance in Invergordon and they make alsorts of types of breads so they maybe able to offer some help. Speak to their master baker, Paul on 01349 831165. Their website is: http://a-bun-dance.homestead.com. my sympathies, it’s awful when your favourite bread isn’t available anymore, or nearby or easily recreatable. me i just pop over to my local supermarket to get me some finnish ryebread, oh the joys of being a swede;) good luck in your search for the ryebread secret! I always stagger back from Germany ( only a couple of hours on the bus , luckily ) with Oldenburg rye bread , sharp and tangy and irresistible . Bread is one of my must-have souvenirs , wherever it’s from. I think you should have your friends ship you a supply when yours runs out. You could have an endless supply of bread. I sure wish I could try it. It looks delicious! Unfortunately to make authentic recipes with that special taste often depends on using the native flour, milk, eggs, starter and whatever else is in the recipe. The natural local growing, feeding and grazing influences the texture and flavors. [When I used to make our Scottish shortbread with my mother it always turned out perfect. When I make it now that she is gone it just never is the same.] You need to have a Finlander stand by and speak to the dough! LOL! Maybe you need to have Finnish rye flour! My father used to make a Polish rye soup. He had to find and try many different brands before he found one that had that real old home flavor. He went to a European bakery in Los Angeles and asked for some of their imported rye flour. Even the potatoes made a big difference in the flavor. I’m sure you will find it soon! 🙂 P. S. I love Polish style rye bread! 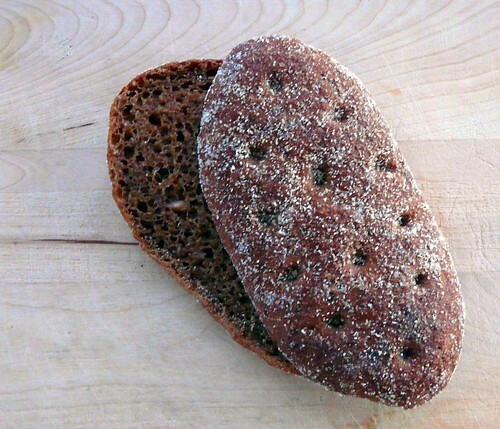 The rye bread from Finland looks so good looks like it has a special texture. Love bread! Shirely – No, no Finns I know bake it themselves either. A few are waiting for me to find out how to do it! Shall check the forums. Nice idea. Lisa – That’s a great idea. Shall definitely do that. Jane – You have no idea how happy that site has made me! It’s not a big deal if I fail now! Chris/Kris – If your cousin wouldn’t mind sending the recipe, that’d be great! Liz – Well, that’s not very far away at all. Shall give them a call if I continue to fail. Thank you! Siri – Moomins are the best! Geraldine – Couldn’t agree more. Gale – They have offered but I didn’t want to put them out as I’d want it for ever more! Karola – You are likely right. Thing is, I can’t even get the bread to be even slightly similar in look or texture, never mind taste. Sigh. The finns that I know that come to America make ruisleipa, to get that great flavor you need a starter (piece of dough from the last batch). I takes about 3 days to allow the flavor to intensify, good bakers know by the smell if it has fermented long enough. Reading the above entry brought a smile to my face – countless times I’ve returned from Finland with exactly the same problem of having to pay for excess bread. Whilst I also thought it was worth it (and it totally is! ), I had the same follow up problem as you; the freezer was empty way too soon. My mum always baked her own rye bread when I was small, and whilst I hadn’t attempted it (you would ideally need a wood fired oven), I decided to give it ago after a couple of years in Scotland. It works wonders!!! Although the rye flour here is slightly paler than the Finnish version, it does not affect the taste. In order to get started you’ll need the sour dough starter. After that, ALL you need is rye flour, water and a pinch of salt. You also need to bake every 3-4 weeks to keep the starter dough “alive”. I have the perfect rye sour dough starter (estimated to be 100-250 years old!!!). My next question is, how will I get a batch of it to you? Trust me, it will be worth the trouble – if not for anything else, to see the look on your Finnish friends’ face when you are teaching them to make ruisleipä!!! I don’t want to share my contact details with everyone, but if you can see my email address, feel free to drop me a line and hopefully I can help you! it would be great if you could share the recipe and the results. I am also on a quest to make this great bread but so far my output – though tasty in itself – was nowhere close :-(. Hi Lotta, I realise that it is many years since you posted, but If you could give me any help with the starter and/or recipe, it would be a great help. I too am addicted to the bread and sadly one trip (and fix) a year just isn’t enough! You mentioned emailing above but I’m not sure how to get your address so I though this would be the next best thing. I have attempted the starter before and failed miserably at re-producing my beloved Finnish bread, I gave up in the end, reading this has sparked the fire again though! Emailling you right now, Lotta! I live in northern Minnesota, USA, where there is a huge Finnish population – every fifth person is either a Kantonen, a Suumonen, or a Juntunen! Nearby lives a very well-known Scandinavian baker and author – Bea Ojakangas – that has MANY cookbooks on the market that include both Finnish and Swedish breads. After reading your blog post, I went and found a recipe for Ruisleipä (Finnish Sour Rye Bread) in one of her cookbooks – Whole Grain Breads by Machine or Hand. Rather than listing the entire thing here, I’ve included a link that will take you to the recipe online. I don’t know if this will help you or not, but I had to at least make an attempt to help out! I know that by now your stock of Ruisleipä is probably gone, so here’s hoping that this recipe will come close to the lovely loaves that you brought home from Finland. FYI: My daughter and I were in the UK for 3 weeks this past summer. We spent our last week in Scotland making a long looping drive – Edinburgh, Stirling, Fort William, Kyle of Lochalsh, Inverness, back to Edinburgh. Both of us fell in love with Scotland and its beautiful green mountains and valleys. Every time I go to your blog, I have this incredible longing to go back to where I left my heart! You are so fortunate to live in such a gorgeous country, with such lovely people. Count your blessings! Hi, I’m not Finnish, but close enough – Estonian.. and I do make my own rye bread from time to time..
Basically you need rye flour, water, bread starter (no yeast! you can make your own from a slice of that delicious finnish bread youo brought), some sugar, some salt and cumin. I have exactly the same problem, I have a Finnish mum & absolutely love the stuff… but I only go to Finland maybe for a month every two years or so and its impossible to find except for in one small shop ran by the Finnish Sailors Church in London. I have translated a few of my favorite recipes, Reikäleipä, Korvapuusti style Pulla (Think you often call it Nisu in America?) and some Marjapiirakka (berry pie). I will hopefully do some more translations in the future. I would be quite happy to try and track down any other recipes you may be craving? Hope I have helped and this works! I’ve made Finnish style rye bread a few times now and it seems to be working out just fine. It takes hell of a lot of effort but nothing quite beats the smell and taste of a freshly baked loaf. The rye flour you can buy in most supermarkets in Scotland works OK and all the Finns who have tried my bread have said it is good. If you fancy some culture (I made mine using out of date Ruispalat after Finnair kindly sent my bags awol for 10 days) let me know and am even wiling to chuck a loaf or two towards your direction if you let me know your details. There’s no need for yeast though if the culture fails to “bubble up” as it should you can always chuck in a sachet of dried stuff – it does the trick. Maybe you have found a recipe already, but this one looks really good, if a little hard to understand in the translation. Oliiviölyä is olive oil, I think most other words are translated ok. The root that is referred to is your sourdough starter. One of the reasons many Finns do not bake the rye bread these days is because it is far more easier to get from the store. I would bake more often if I would have time, but nowdays I do it only about once per year. Additionally the correct flours are difficult to come by in New Orleans. BTW. About the Rye root. I believe it can be stored in the freezer. Another way is to let it dry, like old days. Thank you, Petri. I’ve been struggling with this recipe for years now. Am about ready to give up! About the link above for the “Pehmeat Ruispalat”…. – Salt cured salmon (Graavilohi), with FinnCrisps and dill cream cheese. – Carelian pies (Karjalan piirakat), with egg butter of course. Since I ran out rice porridge for the carelian pies and had some extra rye dough left, and found some canned vendice (Muikku) from the back of the cabin. I decided to make Kalakukko with the remainder of the dough and the canned vendice. Since it was missing some key ingredients of kalakukko and the amount of vendice was not great, the kukko stayed fairly flat, and was naturally not quite correct, yes did indeed turn out very well. I’m hooked too, and came across your wonderful post from last year. Did you find a supplier? I live in London, and am desperate! I came across your blog while searching for a recipe for ruisleipa! Well, as a Canadian born into a Finnish immigrant family, I too long for that Western Finnish staple. SURELY there is a way to make it… even if it’s only close to the greatness! I refuse to accept we cannot make it in other parts of the world! I refuse! If by some magical chance you have indeed succeeded in this very vital endeavour, please please share! Thank you Eila. I know about Viking; their sweet and sour is wonderful. It’s easy to buy at any major grocery. However, it’s the dark chewy bread that I’m hoping to learn how to bake. If you use dark rye ( or whole rye – Hogdson Mills in US has stoneground 100%) the bread will be darker ( find it in healtfood stores- Baker’s catalog used to have caramel powder that people use for pumpernickel bread for color, i think they also had rye sour powder, so you didn’t need to leave the starter out for too long-I make my own recipes by adding in ingreadients I see listed on bread wrappers. For US bakers: After checking Baker’s Catalog ( King Arthur’s Flour) found that they have ruisrouhe= ryechops. They also carry First Clear Flour= it’s wheat flour that gives rye bread the “chew”- have used it before- works. Baker’s Catalog is a treasurechest of tips for baking Hope this helps. Hei I have just read your blog on Finnish bread. seems I am not alone. I used to work there and really missed the bread. So had to learn to make it. I can make Reikäleipä, its the only one I can do “authentic”. I think the main thing is to get the sourdough right. This involves a starter. how ever this is not so hard. all you need is good quality Rye flour and water. The rye has enough natural yeast in it to get it going. Its slow…. and should have no off smells. just slightly sweet and of rye. a basic 60 40 mix with a little salt and a couple of spoons of oil, I use rapeseed. mix about half the dry mix with enough water and starter to get a thick batter it should take off like a train for a start. then slow a lot. after 10 mins at high heat open up oven and spray down again. this forms the chewey crust..
30 mins at about 200 should see the job done. I know exactly how you feel. I have a friend who lives in Finland and visit regularly. Trying to source their fantastic rye bread here is proving very difficult. Have you had any luck finding a supplier? I live in south Yorkshire so I know we are miles apart but any help would be gratefully received. I got lucky and went back to Finland last week with my job. I was there all week and yes I ‘m back with a bagfull… but to compare my home made with the real thing; actualy mine is pretty close. I am sure its the sourdough I use, I now have a Russian one which seems to be pretty much bang on. If any one wants a starter contact me, I will be happy to send some by post. no problem I can send a starter, I take it you are in UK? if not don’t worry I will post anyway and see what happens! At the moment there are 3 x on the go, and 2 x are proving worth. The other is fine with wheat flour it seem to make bigger holes in the bread!!! probably due to more gluten. Wendy, do you have Lidl stores in Scotland? I’m in England – and here in Lidl, they sell a baking mix called: “Rivercote Country-Style Wheat-Rye Wholemeal Bread”. That’s what I use for Finnish rye bread. It has the sourdough mixed in it, you just add water. I make Finnish flat-bread with it ((with a whole in the middle), or small reissumies type bread. Oh, and two more things. looks like the Lidl mix, maybe you can order that and use that to bake rye bread. I understand your frustration. I, too have lived in Finland, and I know how much you can miss their bread! THANK YOU for this thread. I was an exchange student during my junior year of high school. I lived in Kotka. Every now and then, I look for a way to find this bread and yours is the best thread on it I’ve found. I’ll troll it for options. If you’ve had success with a recipe, I’d LOVE to know it. Not sure if you’re still hunting down a good Finnish dark rye recipe, but I have one I’ve used for decades now after being an exchange student to Finland. Hope it is helpful. I would like to know how and where to order your Finnish rye bread. It is my husband’s favorite. A fantastic tasting 100% dark rye traditional Finnish sourdough bread is produced by Kotileipa, here in London. Check out the website http://www.Kotileipa.co.uk for more details on how you can purchase the mouth watering traditional sourdough 100% rye bread. Kotileipa is also sold at the Finnish Church London. I’ve modified it a bit. Before the third and last rise I put the dough in a loaf pan lined with parchment. That way I don’t handle it at all after it has risen, so all the bubbles stay intact. Scandinavian Baking by Trine Hahnemann has recipes for different types of rye breads. once you get the hang of it you can try your own mashups. Did you figure it out yet? I’m trying it this weekend and worried it won’t be dark like it should. Never did get this right. If you manage, let me know! I suspect the missing ingredient might be red rye malt — it adds a wonderful flavor and darkness. I’m about to try a jälkiuunileipä from Stanley Ginsberg’s The Rye Baker. Fingers crossed!